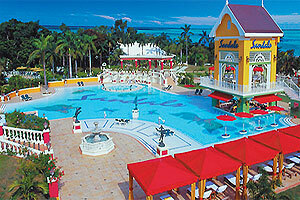 Sandals Grande Ocho Rios Resort offers 237 of the Caribbean's finest rooms and suites in eight categories. Nestled between luxuriant hillside gardens and the glistening turquoise waters of the Caribbean, this modern-day Garden of Eden promises a veritable taste of paradise. From championship golf and a renowned scuba program to private strolls along Ocho Rios' longest sugar-white-sand beach; from world-class gourmet dining to stolen moments amid the fragrant, jasmine-scented gardens, this exquisite sanctuary offers something to tempt even the most demanding of souls.